Ah, thou noble Timpanist, how well and proudly dost thou perch above thy orchestra. There you sit enthroned amidst thy noble drums, a hundred feet above the silent decks, striding along the deep, as if the masts were gigantic stilts, while beneath you and between your legs, as it were, swim the hugest monsters of the sea, even as ships once sailed between the boots of the famous Colossus at old Rhodes. 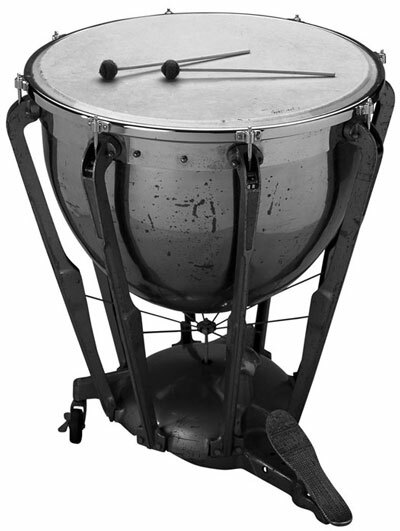 As you can see in Figure 1, kettledrums — a more common name for the timpani — look exactly like kettles. Upside-down kettles, that is. With no spouts. And no handles. And no openings to pour the water in. Unlike most other drums, kettledrums are meant to be tuned to specific notes — big, low, booming, walloping, godlike notes. Remember the monumental opening music from the movie 2001: A Space Odyssey? That music, actually by Richard Strauss, makes dramatic use of the timpani’s unique capability to go . . .
You tune a kettledrum by tightening or loosening the head. (That’s the plastic “lid” that’s stretched tightly across the opening of the kettle. Now you don’t have to ask your doctor why your eardrums are known as the timpanic membranes — it’s because they’re stretched tightly, just like a timpani head.) On old instruments, you adjust the pitch by twisting several screws located around the circumference of the drum — not exactly something you can easily pull off in the three seconds you have between sections of a symphony. Fortunately, that clumsy process is going the way of vinyl records, hula hoops, and DOS. Nowadays, all timpani come with foot pedals. As you push down the pedal with your toe, you tighten the head; and as you push down with your heel (lifting the toe), you loosen the head. In other words, you can tune your kettledrums incredibly quickly. In fact, you can even change a note while you’re playing it, making the note slide up or down. You hear this special effect (a glissando) in Saturday-morning cartoons, every time the fat guy gets kicked in the rear or shot from a catapult. It’s a truly arresting effect. What timpani are best known for, however, is the roll. A timpanist executes a roll with two mallets, striking the drums with each mallet alternately, at blinding speed. Many timpani rolls are accompanied by a gradual increase in volume. The climax of this increase is generally signaled by a momentous crash from the rest of the orchestra. This effect is so common that it’s become a cliché. The word timpani is Italian, and it’s plural, because you never see fewer than two in one place (except in Figure 1). Composers never write for a single kettledrum. You can hear the timpani strutting their stuff (along with many other percussion instruments) in Béla Bartók’s Music for Strings, Percussion, and Celesta— an ingenious, way-out work of music. For that matter, the timpani make an especially striking appearance in Beethoven’s Ninth Symphony (second movement), Richard Strauss’s tone poem Also sprach Zarathustra (Thus Spoke Zarathustra), and the finale of Shostakovich’s Symphony no. 5.